"Fantastic vegan meatballs even my 4-year-old daughter and picky 70-year-old father love!" Mix warm water and egg replacer together in a large bowl. Stir in vegan cheese, tofu, nutritional yeast, salt, and garlic powder. Add onion, pecans, Italian seasoning, basil, and sage; mix until well combined. Stir in enough bread crumbs to reach a moist, crumbly texture. Form mixture into 1 1/2-inch balls and place in an 8-inch baking pan. Mix grape jelly, ketchup, olive oil, vinegar, garlic, and oregano in a separate bowl. Pour over meatballs. 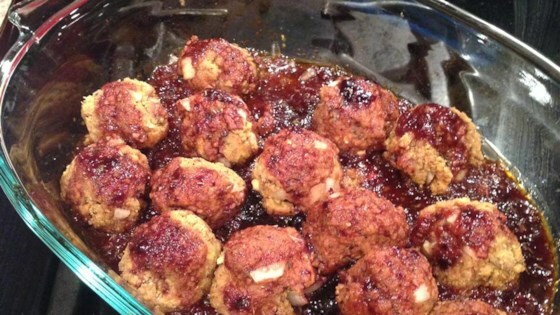 Bake in the preheated oven until meatballs are firm, 35 to 40 minutes.